Why are there, too often, poor outcomes in cases involving intractable contact disputes, implacable hostility and alienation? 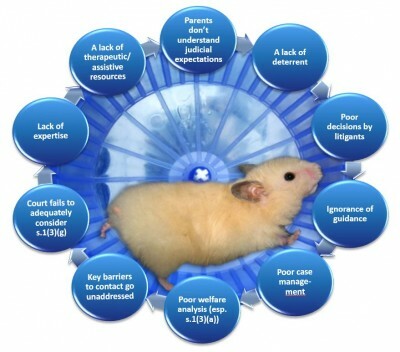 There are a common group of reasons, mostly related to poor case management, incomplete welfare analysis, a failure to re-establish contact at an early stage compounded by the court not addressing, discouraging or sanctioning parental non-compliance with court orders. Communication is also at the heart of problems, both in terms of the lower courts being at times seeming oblivious to guidance from more senior and experienced members of the judiciary, and parents not being sufficiently aware of the court’s expectations. It is a paradox that in public family law, the President of the Family Court has given stark warnings that the court should not set a social model of family perfection and unreasonably interfere in family life. Parents come in all shapes and sizes and it is only when children are at risk of significant harm that the court should intervene to remove children from their parents’ care. In private law, at times the most trivial things cause the cessation of parent/child relationships with the court doing too little to intervene too late, and after an interminable number of directions hearings and delay. The child’s right to family life becomes quashed with the loss of one parent, grandparents and the wider family, with the child and one branch of their family experiencing an unnecessary bereavement with inadequate thought given to the impact on the child’s immediate and long-term welfare. Despite research from organisations such as the Children’s Society and leading academics confirming a direct correlation between poor teenage mental health, poor academic outcomes, teen pregnancy and youth crime with the cessation of contact, there is no formal process to guide the court in what are acknowledged to be complex cases. There is no list of approved experts specialist in helping in such cases. There does however exist good practice, and we propose that the best practice in the courts, from the most senior and experienced members of the judiciary be shared in formal practice direction to help reduce the lottery which currently exists. Where knowledge is absent, formal process becomes essential. In 2014, Sir James Munby, President of the Family Court spoke at the AGM of the charity Families Need Fathers, and invited discussion around this sensitive area of family law. In 2015 the charity approached The Custody Minefield to draw up a discussion document detailing the problems in the management of intractable contact dispute cases, and setting out realistic and affordable proposals to improve outcomes. The presentation below was given to the members of Families Need Fathers Families Need Fathers at their Annual General Meeting on 6th March 2016 and outlines the proposals presented to the President of the Family Court in meetings in September 2015 and February 2016. A copy of the discussion document which sets out the detail of our proposals can be downloaded here. Click on the Full Screen button and press Page Up or click your left mouse button (with the pointer on the presentation) to go to the next slide. We also provide navigation buttons and download buttons throughout the presentation taking you to additional content and self-help resources. A copy of the powerpoint presentation can also be downloaded here. You may find it helpful to view the earlier presentation “Parental Alienation: Developments in Law” presented at Families Need Fathers’ 2014 AGM where Sir James Munby was also a guest speaker. 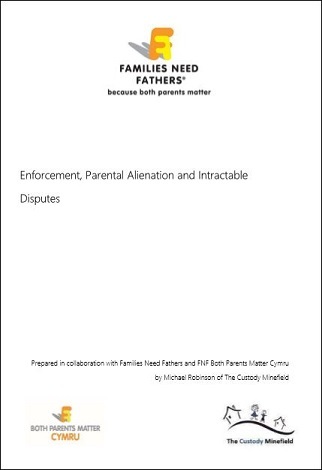 We have recommended to Sir James that the case law guidance included in the 2014 presentation forms part a new practice direction specific to cases involving parental alienation. Cited case law can be downloaded from links provided within the presentation. Once again, click on the Full Screen button and press Page Up or click your left mouse button (with the pointer on the presentation) to go to the next slide. We also provide navigation buttons and download buttons throughout the presentation taking you to additional content and self-help resources.